An afternoon of the traditional and modern gamelan orchestra – evoking the ancient world of Java through live music, dance, song and verse and celebrating the 5th anniversary of Langen Suka. Langen Suka Sydney Gamelan Association has been performing, holding workshops, featuring in festivals, teaching classes, and promoting Javanese culture and performing arts in Australia for five years. On 28 November 1999, this association was launched in Sydney under its present name at an enormously successful performance of gamelan music, song and dance entitled Puspawarna: Many Kinds of Flowers. Now, exactly five years later, Langen Suka wishes to revisit the spirit of that original launch and to recognise the expansion and development of the association’s work as one of Australia’s leading Indonesian arts ensembles. Langen Suka has blossomed as an arts group since that time and has also expanded its reach through contact not only with other artists and lovers of Indonesian culture, but with the greater community by promoting Javanese arts and performance. It has been a joy for the association to see develop over this time, through its activities, a network of people who have been linked together by the common appreciation of one of Australia’s largest and closest ancient cultures. In the Javanese arts the flower can mean a musical phrase or song; a blossoming of sound; an expression of dance or movement; and an individual, in character and appearance. Whereas the “many flowers” of the Puspawarna performance five years ago represented the many varied sounds, musical and dance pieces of the traditional Javanese gamelan, now for this anniversary concert Langen Suka is celebrating how those flowers have joined with many others to form a web, a net, a tapestry: Puspanjala. 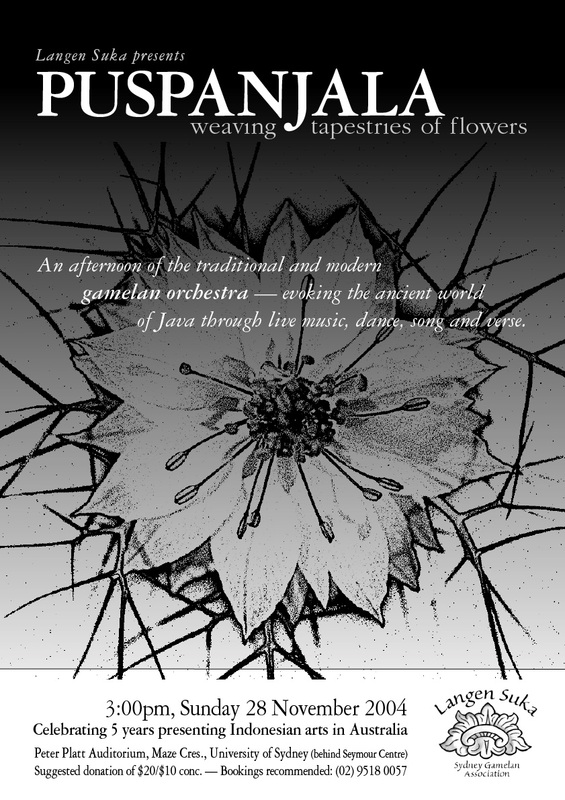 In its role now of interlocking and interwoven activities within varied communities, as well as its promotion of building stronger links between those communities, we would like to celebrate with you a part of our tapestry of flowers.